By now everyone knows the passing of my grandmother 2 weeks ago. I was looking through hers and grandpa's Cedar Point things and came across a few old postcards from Coney Island. I remember posting a postcard of theirs a couple years ago here on KIC which gave a good shot of the cable cars. I assume that wooden coaster in the distance is Shooting Star? Very awesome! And yes, that coaster on the right is in fact the turnaround for the Shooting Star. The Wildcat coaster used to stand at the end of this shot, but was removed to make room for the skyride station seen in that shot. Wow! Thanks for posting those! What an awesome looking place. It had to have been devastating to so many people when they found out it would close down! Again, thanks for sharing such wonderful images. I love seeing the park in its heyday like that! When I see pictures of CI, it looks like something out of a movie. The trees, the landscaping, even the signs on the attractions (I really like the Skee Ball one). Kind of makes me wonder how much ranting would have been going on if a Coney Island forum existed in 1970... Worse than the Geauga Lake forum? I was a big fan of Geauga Lake. I think what happened there was very, very sad. Remember, Coney Island was "America`s Finest Amusement Park." 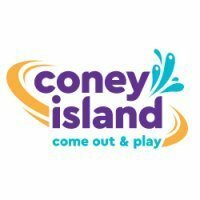 Be sure to check in on Coney Island Central in the coming days. I`ve been working on a small update that will certainly please you if you liked these photos! If you liked those photos, I highly recommend digging up a copy of the 1972 book Goodbye, Coney Island, Goodbye by Paul Ilynski, which is sort of a tribute to the park. It has some nicely done black-and-white and sepia-toned photos and reminiscent text of the days gone by. My dad has a copy of it and I never get tired of looking at it. Although the book is out of print, it's still fairly easy to find on the web. That Sky Ride was very high! You Guys Should see the Treasure stuff my Friend Al has from Coney Island and KI from back in the day. I got a Few Rare Shooting Star pics he gave me that are really neat. Thanks for posting those, Amy. It makes me a little wistful to see parks like that, knowing I never got the chance to go (of course in some cases, I can't help that I wasn't born yet!). I agree! I am sad that I never got to experience Coney in its heyday. Coney is celebrating its 124th birthday this year. June 20th of next year will be the official 125th birthday. Adam, I`d love to see those images of the Shooting Star some time. Are they planning any special event for this momentous occasion? Maybe a giant carousel cake like they had some 50 years ago? Well, its still more than a year out. At any rate, I suspect they will open the time capsule that sits in front of Moonlite Gardens. That time capsule was placed there in 1986, when Coney turned 100 years old, and it states that it is to be opened on June 20th, 2011.